Since 2008, I’ve been fortunate enough to work in Performance Marketing at a variety of positions, and to work at home for most of those. I’ve been an affiliate manager and, for a time with FMTC, I was running all the sales, marketing, customer service, and social media. It’s been an exciting adventure, that’s for sure. 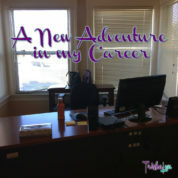 For the last 18 months or so, I have been working on starting my own marketing agency, Blinkstar Media. The time has come, however, to put that on hold for awhile and start a new adventure working in direct marketing, going back to commuting to an office every day.